To bring us up to date on efforts to contain Mali’s Ebola outbreak, here is a post from a guest blogger who recently concluded a visit to Bamako where he observed the ongoing public health campaign by various international, governmental, and non-governmental organizations, including the one he manages. Almost every restaurant, bar, and hotel in Bamako currently has a professional greeter, responsible for distributing squirts of hand sanitizer, ensuring any entrant washes their hands from a newly installed tap, and checking the temperature of every person through the doors with an infrared no-touch thermometer, held an inch away from one’s temple. 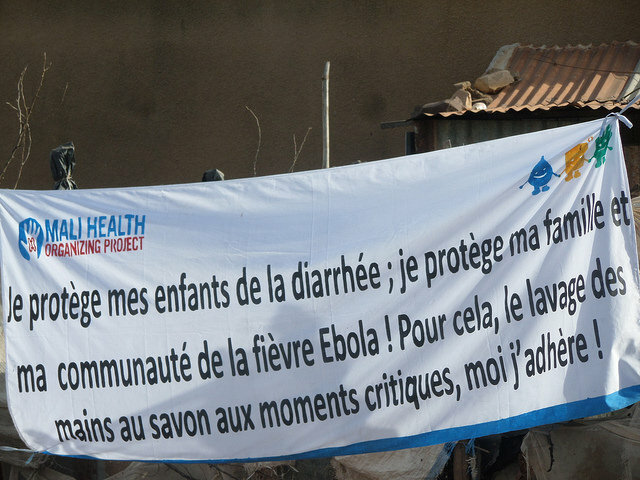 On the streets, billboards, fliers, and a loudspeaker-mounted vehicle announce Ebola education and prevention messaging, while fact and rumor twist through communities and whispers. 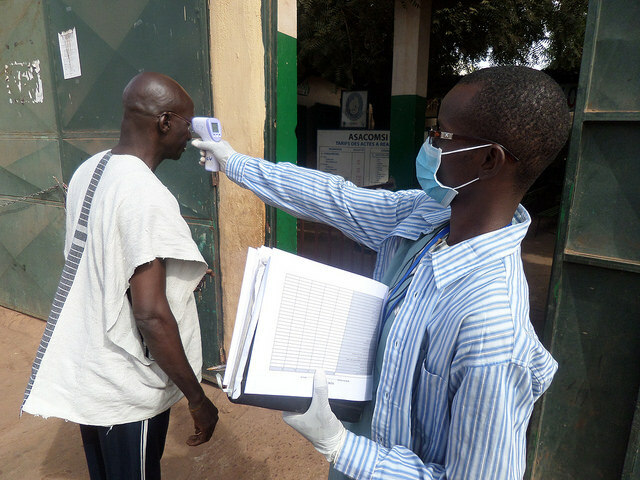 In late October, Mali recorded its first recorded Ebola cases. First, a young girl carried the virus across borders from Guinea. Despite her having been in contact with hundreds during her voyage, initially there were no other cases. Then, an imam from Guinea sought treatment in one of Bamako’s best clinics, frequented by expatriates, UN soldiers, and Mali’s upper class. The imam died, as did a nurse and doctor who treated him, a mosque worker who cleansed his body, a friend who visited the imam in hospital, and a child of the deceased nurse. The second outbreak resulted in hundreds of additional contacts throughout the city, and has inspired deep concern around the preparedness of the public health system in Ebola’s newest breeding ground. Its geographic and political state contribute to the precariousness of Mali’s situation, a large, landlocked country that borders seven other nations, including a vast, mostly ungoverned swath of earth – the Sahara Desert – that runs across Mali, Mauritania, Algeria, and Niger. An uncontrolled outbreak here could easily spread beyond the grasp of NGOs and governments, crossing borders unchecked and sharing territory with the likes of banditry and terrorism, both causes and effects of Mali’s 2012 coup d’état. Adding to this geopolitical quagmire are refugees in Niger and Mauritania and seasonal food insecurity. A low rate of doctors per capita and a longstanding user fee healthcare system further compound Mali’s current fragility. International actors recognize this gravity. The CDC and WHO softened their predictive forecasting recently, should Mali become the fourth country overrun by Ebola. WHO Director Margaret Chan recently visited to motivate health workers and international actors to respond aggressively. The New York Times editorial board has rung the canary call, appealing for fast, international action, while the UN and USAID have both opened emergency operations offices in Bamako over the last week. Yet right now, it’s fast action and small efforts that can go a long way. A small dedicated CDC team seemingly managed to track most or all of the contacts across the city. Mali Health, the NGO I direct, has been working since September to education, inform, and prepare, as our community-based efforts to improve maternal and child health dovetail seamlessly into effective Ebola response. And most recently, our redeployed Community Health Workers have worked as Contact Monitors to check in with every contact twice daily, taking temperatures and monitoring any symptom development. Their gridded pages have been slowly filled as contacts reach their 21 days. Active case finding – sending local teams into communities to screen for the sick and educate families and parents about prevention and healthy habits – is one of the many roles a Community Health Worker can play, and if effective, can make enormous difference. Another is developing trust. While Ebola is spread by the contact with fluids, rumors are airborne, often complicating prevention or treatment efforts. The new Ebola Treatment Unit in Bamako, staffed by MSF, is where people are killed. Ebola is a white man’s conspiracy. Even, Ebola isn’t real. These sentiments highlight the very common breakdown of trust and understanding between communities and the health system, both local and international. In Sierra Leone, despite heroic efforts, this resulted in the forced quarantine of all residents in its capital city. In Mali, it’s clear how easy this would be. Already there are whispers of cases being hidden by their families. But there is also a dose of heavily guarded optimism. Mali has had two Ebola survivors walk out the doors of its treatment center over the last weeks. If Mali reaches January 18th without another case, it can be declared Ebola free. But with more cases closer to the border in Guinea and the very real ongoing risk of complacency, there remains a strong likelihood that cases could return. Trust must be built and nurtured between the health and local communities through a national response of coordinated Community Health Workers. Early treatment must be promoted and adhered to in order to limit contacts and increase survival, and the system to support such practices put into place. If an early warning system can be implemented, trainers trained, clinics prepared with proper screening and protocols, and enough equipment and medical personnel in place to quickly trace, place and face each case, Mali could avoid the breakdowns incurred by Guinea, Sierra Leone, and Liberia, and would provide a blueprint for hope and effective execution. 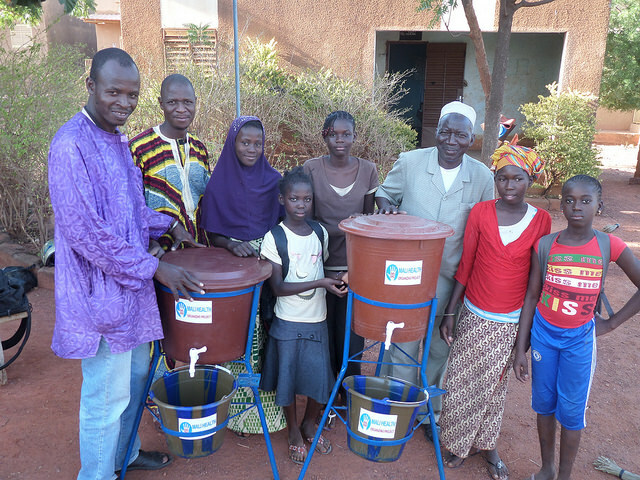 – Kris Ansin is Executive Director of the Mali Health Organizing Project, which works to promote awareness of and access to community health programs. This entry was posted in Uncategorized and tagged bamako, Ebola, Health. Bookmark the permalink. Thank you Bruce for your continued insight. I’m currently in Bamako, and I have to say that I have not had one temperature check at any bar, restaurant, etc for the last week. Interesting, Julie. By the way, congrats on your article in City & Society! One time at Amandine they made us use the hand sanitizer, but that was it. People by and large understand that Ebola is a real and serious issue, despite rumors (that from a Malian doctor who went through people’s suspicions about HIV and finds that comparatively far fewer disbelievers/conspiracy theorists with Ebola). All of this bodes very well for Mali’s ability to combat the disease, as has been shown by the fact that it has not spread, but also I have to say that there are other MUCH more deadly or serious issues (like traffic/route accidents) that could use some attention. Are songs like Africa Stop Ebola getting much airtime? Any sense of whether any of the songs are contributing to the education efforts about Ebola?